You can design the beanie pixel perfect. Please note restrictions may apply especially when too many color changes happen every other pixel in one row. 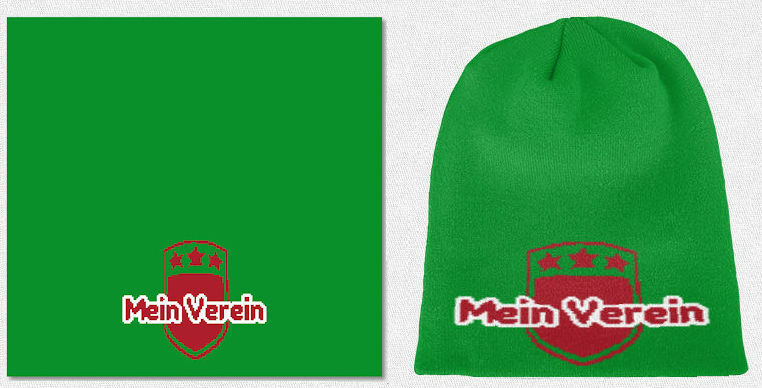 If you already have a football scarf from Wildemasche: The beanie is knitted in a different knitting technique. That's why details and implementation are different. Same pixel design will look different as beanie or as scarf. Number of colors up to 4 colors can be picked from the color palette. Photoshop users: check out topics related to "Converting color modes", especially "Convert RGB image to indexed color". Number of pixel / stitches 240 x 230 Pixel. To download a template you can design, start a beanie in the online designer. Click on top right on "Share design", then on "Download"
Resolution (DPI) Standard / 72 dpi. When correctly color reduced, one pixel has one color, there is no resolution anymore. Margins You can design the whole beanie. Upper 20% of the design will be gathered because of the stitches. At the bottom, a margin of 5 to 10 pixel is recommended. You can wear the beanie in any orientation, if the endings on the left and right fit together smoothly regarding the design. For bar patterns, there is a 1 pixel offset when new row starts. Distortion The design is knitted pixel perfect, one pixel in the image becomes one knitted stitch in the beanie. When transferring graphic to fabric. The distortion is about 50% horizontally. A design with 50% width will have 100% width in the knitted beanie hat. The distortion is displayed in the online preview, and can be cancelled out by compressing the design. Vector files, files with huge dpi values or huge file sizes do NOT improve the quality or details of the knitted product. Everything that's larger than the size given above has to be resized and pixelized (rendered as bitmap) in order to be knitted. Send your design with email, or upload it as image in the online designer (top left in the Online Designer, click "image" and upload as PNG/JPG). If you are not sure if your file is color reduced correctly, upload the file in the Online Designer and do the color reduction there. Files often have to be optimized manually after resized or color reduction. The pixel perfect final touch can be done in the online designer, zoom in the design to work on the details and use pen, eraser, color replacer and flood fill tool.